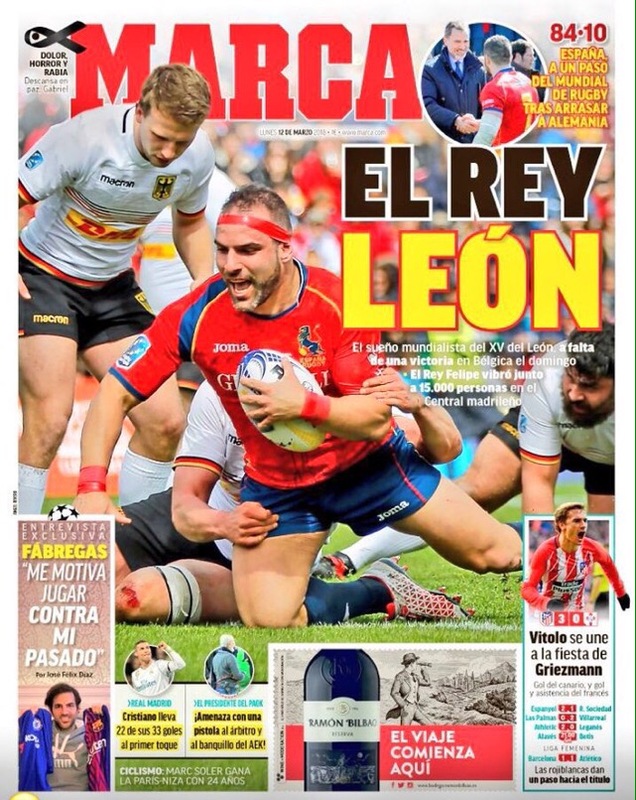 There is an old saying “You only get one chance to create a first impression”, for the game of rugby, in the football mad country of Spain, that chance came on Sunday 18 March. For once, rugby was on the front pages, it was on prime team television and radio, this was the moment the rugby lovers, and supporters of Spanish rugby, had been waiting for, a chance to showcase their wonderful game, and its values, to let the uninitiated and the casual sports fan know just what the our sport was all about. The bars and cafes across Spain were alive with anticipation and excitement, over a Cortado and a cerveza people were speaking about Malie instead of Messi, Rouet and not Ronaldo, and instead of Bale there was talk of Belie. But sadly What was intended to be a celebration of Spain’s potential qualification for next years Rugby World Cup in Japan degenerated into an ugly and sordid affair, resulting in a complete antithesis of everything rugby people dear. All the unseemly events that unfolded that afternoon of which we are now all too familiar, came about as a direct result of the actions, or rather the inaction of Rugby Europe. This was an accident waiting to happen, Rugby Europe appointed a Romanian referee to a match where his home nation and employer would directly benefit from a win for Belgium. The “Ref Team” should never have been put in this position and in my opinion Rugby Europe failed in their duty of care to the referee and his Romanian assistants. Requests by the Spanish Rugby Federation to change the officials were refused, as were the requests for a Television Match Official for what was the biggest and most important rugby match in the world on that particular day. Conspiracy theories abound, investigations, conversations, recriminations and conference calls are all ongoing, and to add to catalogue of catastrophe Russia has now complained that Romania fielded an illegible player during the qualifying tournament. The real loser, whatever the final outcome of the governing bodies findings will not be a referee, or even Spain or Romania, the loser will be rugby itself. Many of my Spanish rugby friends are heartbroken, not because they lost a rugby match but because the years they have spent fostering and proclaiming the spirit and values of rugby, whilst being global ambassadors for the sport, have been compromised and disrespected. A wonderful and unique opportunity to spread the development of rugby in Spain has been blown, hearts and minds have been lost, some forever. If that match had been the first rugby game I had ever watched I’d have switched to the round ball game overnight. The Spanish team did not cover themselves with glory either after the final whistle, and the scenes witnessed were disgraceful, shocking and depressing in equal measure, but would these unseemly events have occurred if Rugby Europe had carried out its duties competently, and appointed a team of officials from a different country. World Rugby, the game’s governing body, are awaiting Rugby Europe’s explanations, and I have no doubt there will be repercussions, whether these will be to Spain’s advantage I have my doubts. Whatever happens Spain can still make next years World Cup, and I hope their anger and frustration will be channeled and prove to be a motivating factor in their efforts to beat Portugal, and Samoa, to secure qualification for RWC 2019. The rugby world will be wishing them well, and just maybe those hearts and minds lost on that wet Sunday afternoon in March will be recovered next year in the Japanese sunshine. The land of the rising sun would be the perfect place to see a new dawn for Spanish rugby.